Slow worms under Onduline today. Cloudy but warm so plenty of lizards showing, over a dozen juveniles scampered off the felts when I went to take a look. Not seen a grassy for a few days, will try to get a picture of one soon though. I have high hopes we had eggs laid in the compost this year so will be keeping an eye out for little bootlace grassies over the next few weeks. There is a mix of very general information with the option of following links to more scientific info if required. It is one of those things, we all hear of grass snakes using compost, but we get hit and miss results. I've no doubt grass snakes have used the heap in the past, but this year it seems more of a cold heap so 50/50 if it was used or not. I would love to pin down a method of building a heap each year that practically guaranteed the local grass snakes using it. The one element of composting I want to avoid is turning during the months the eggs and young are in the heap. So the plan is over the autumn and spring to come up with a method and hopefully see the results. I thought about avoiding layering and making up small batches of mixes with the right C/N ratio right at the start (to avoid turning). This would mean I do not need to turn the heap and it should produce heat. I might though have to think of an alternative way of aerating such as putting in air tubes. Much to ponder but I will update on this thread as the plan comes together. Any thoughts or suggestions are of course more than welcome. Interestingly the start of the heat producing composting process, the mesophilic is short lived (few days) and rapidly becomes too hot for the eggs. It seems the only useful period to grass snakes in the process is the cooling and maturation phase. 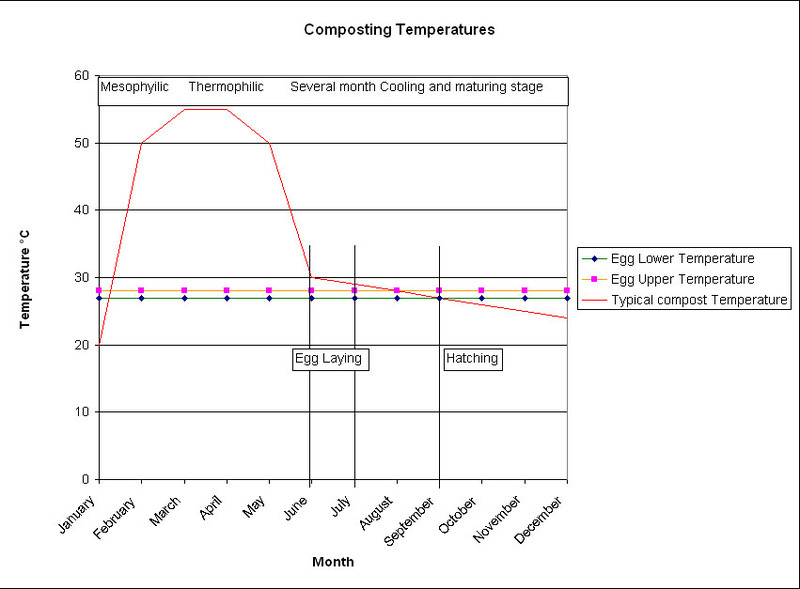 Now bearing in mind that any actual compost heap will not follow the model exactly (some areas will likely be cooler and more suitable than others without getting too scientific) it still follows if one could aim to compost to the model above it might guarantee a high success rate for the eggs. 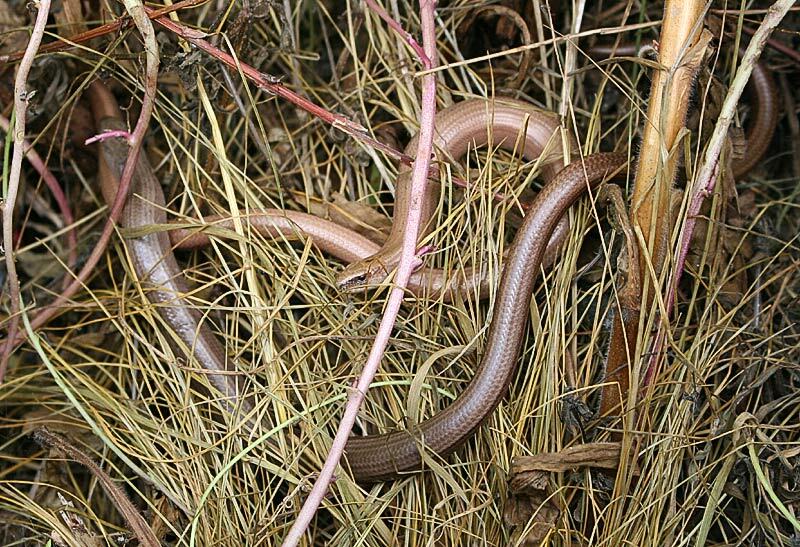 From my model I can safely turn the heap in February (too hot for slow worms or snakes to be in there), this is sometimes a good idea if the heap is getting very hot to aerate and prevent excessive heat killing microbes. Then again in May. I thought a good mix up in May might get the aroma going to attract grass snakes. It is a case really of weighing up what materials are available when, how to get the C/N ratio near to optimal and then monitoring the core temperature to see if I am anywhere near my ideal model. I just turn the heap in late winter / early spring (around March), put a tarpaulin over it and leave it undisturbed till the following winter. In the meantime I start a fresh heap next to it. Occasionally I've found the shells from a clutch in the fresh heap, but generally the grass snakes seem to breed quite successfully in the covered heap (and bask under the sheet). Never found any evidence of snakes overwintering in the heap, and after hatching I get the impression they disperse pretty quickly. Chubsta, from my pondering I pretty much agree, composting can be that simple right to being a complicated science. I see though some wildlife managers are encouraged to put in heaps for grass snakes and there is little guidance really regarding what makes a good heap that might get used for egg laying. PondDragon I think this is going to be close to the actual practice I follow. I have a large heap as pictured, think the plan will be to clear half for a new heap this Autumn. I will want to follow the temperature next year though and see how close it is to my model. I would guess generally it just works, most of us having more material available in the autumn months, so by the next egg laying periods it is very likely the heap is in the cooling/maturing stage. In the past though I have not really given much attention to C/N only adding some greens and browns so I think some years I end up with much better heaps than others. The plan is to get that consistent if possible and compare to see if it really benefits the snakes in the real world. Just to add having a split compost heap, one side new one side mature has a lot of logic too. I can imagine if the new heap was still rather hot come June/July a nice temperature gradient would exist where it contacts the older adjacent material. So a good model to work with. I don't think my heaps get particularly hot - they generally suffer from being too dry and insufficiently well mixed. They seem to do OK for the snakes though, and produce compost that's usable if not especially high quality. That would be my average heap up to now also. Right now I think it is inverts rather than microbes doing the composting and we have huge numbers of them in the heap. It seems a bit hit and miss though and can take several years to get the compost. The best grass snake year was when we had a pet rabbit. The bedding mixed with poop fired things up a bit and the heap was definitely more heat orientated and the garden was full of bootlace grassies that autumn. It's interesting to investigate as a milder version of a 'heat producing' heap might be much better, considering the very high temperatures involved in the model. What I'm really aiming for is an annual cycle that works out each time, both for the snakes and me. Each year I have the material and the hard work is getting it all together and chipping it. It would be good to be a bit more sure I am doing the best I can with it for the snakes. The only technical bit really is to use the same materials that are always available to me but calculate the amount of fresh horse poop and browns to get the ideal C/N ratio. Get the heat phase over by June/July and things should be good. The inverts can still carry on with one side of the heap and I would guess move into the new side as it cools. So I get my composting done in a season and hopefully still generate ideal conditions for the snakes.